Benito shows what he's got. The Fascist State shows what it's got. 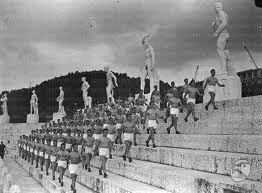 The great centerpiece was the Stadio dei Marmi (Stadium of the Marbles). Every province signed on to the program and donated an exemplary work of sculpture. Left, a footballer from Sassari. Right, a boxer from Ascoli Piceno. But then Regime Change ensued. Soaking up sun and imperial vibes at the Stadio dei Marmi. View across the Stadio dei Marmi toward the hills. 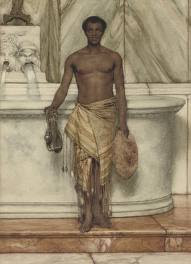 Sir Lawrence Alma-Tadema meets Sir Laurence Olivier. Love to visit this place...Where is this Stadio dei Marmi exactly located? I've been living here in Italy for months yet I haven't happen to visit its tourists spots and enjoy the place. Unfortunately I'm bound with my paper works...Hope this weekend I can have time to visit that place. On the Trastevere/Vatican side of the Tiber, all of the way out to the foot of Monte della Vittoria across the Ponte Duca d'Aosta, in the Stadio Olimpico area - which can be a hell of a trek (especially if you are stupid enough to do it on foot, like we did, on a hot August afternoon.) 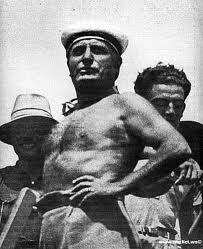 There are buses, however and the Foro Italico/Stadio dei Marmi area is not to be missed, if you crave a running jump into the strange world of Benito Mussolini.